Remixed, remastered, released on CD for the first time, including previously unreleased bonus tracks! Paul McMahon - guitar, vocals, bass on 6, drums on 11 & 12. Chris McMahon - bass, keyboards, backing vocals. Arthur Deas - drums on 1-8. Andy McNaughten - drums on 9 & 10. Dave Kirkham - drums on 13 & 14. Jill Stoddart - flute on 2 & 4. Judith Copley - flute on 4. Derek Nash - alto sax on 6. 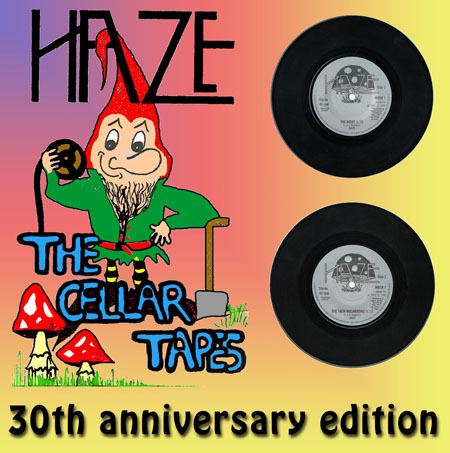 Sleeve notes:- For a while now I had been considering releasing 慣he Cellar Tapes� on CD. Inspiration was provided by the number of fans who have sent me CD-Rs of our old recordings, and opportunity was provided by Paul Pearson lending me a portastudio, enabling me to remix the original 4-track tapes. 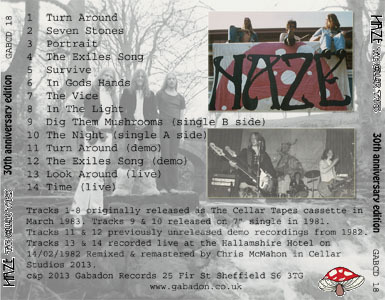 The idea for including the tracks from the 7� single and some live tracks from the Hallamshire Hotel came from John Moorby, who sent me just such a compilation CD. In unearthing the Cellar Tapes master cassettes, I also found recordings of 慣urn Around�, 慞ortrait�, 慣he Exiles Song� and 慣he Vice�, made just prior to our recording 慣he Cellar Tapes� with Paul McMahon on drums. 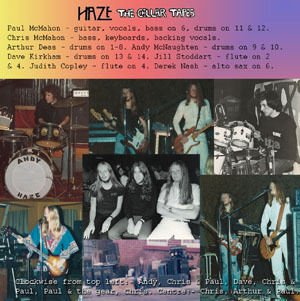 The live recordings that finish the CD off are taken from our show at the Hallamshire Hotel on 14th February 1982, with 2nd Haze drummer, Dave Kirkham. I抳e done my best to improve the sound, but as they say 憈he CD format may reveal inherent defects in the source material�. Indeed. Chris. Download the CD and bonus tracks here. Order the CD here.